Here's where to watch every episode of The Ellen DeGeneres Show season 13. Mouseover or tap an episode to see where to stream it. Click or tap the play icon to stream it on the best available service. Caitlyn Jenner Sep 8, 2015 Olympic champion and Arthur Ashe Courage Award recipient CAITLYN JENNER makes her first talk show appearance since becoming one of the most high-profile transgender women in the world. Ellen’s exclusive will learn all about her new life – what’s the same, what’s changed, what’s gotten better since her transition – and they’ll discuss Caitlyn’s outlook for the future and hopes for the transgender community. Caitlyn will also give details on the finale of her fascinating docuseries, “I Am Cait”! Then, Ellen shares a heartwarming story of a chance encounter and act of kindness that has inspired people around the world! Malala Yousafzai, Ice Cube, O'Shea Jackson, Jr. Sep 9, 2015 Today, Ellen is honored to welcome a Nobel Peace Prize winner, activist and author, a woman recognized around the world as a hero… Malala Yousafzai is here! At the age of 15, Malala was shot by the Taliban for publicly defying them and demanding education for all Pakistani women. Since then, she has made it her life's mission to advocate for the education of all children, and has done so among the world's most prominent leaders. With the upcoming release of her new documentary, "He Named Me Malala," and her high school exams out of the way, this most impressive teen is stopping by to have some fun with Ellen! Then, "Straight Outta Compton" and right onto Ellen's stage, Ice Cube returns with his son O'Shea Jackson, Jr.! O'Shea plays his dad in one of the summer's most successful movies, documenting the rise of N.W.A. and gansta rap. They're here together and they're ready to "express" themselves! Hillary Clinton, Pink (New York City Show) Sep 10, 2015 She could be the first woman to serve as President of the United States! In her first talk show appearance since announcing her candidacy, Democratic presidential candidate Hillary Rodham Clinton sits down with Ellen on our special stage at Rockefeller Center in New York! Hillary will give Ellen the latest on the campaign, and her growing family! You won’t want to miss this exclusive interview with one of the world’s most amazing VIPs! Plus, where there's political talk involved, there’s gotta be 5-year-old presidential expert Macey Hensley, who makes her Season 13 debut! Then, pop superstar P!nk performs "Today’s the Day," our Season 13 jam! Jimmy Fallon, Pink, Oscar Hernandez, dancers from the Arizona Rattlers Sep 11, 2015 If there’s anyone who should be joining Ellen on her New York stage at Rockefeller Center, it’s “The Tonight Show” host Jimmy Fallon! After all, he only has to take the elevator. Jimmy comes through to catch up and hopefully take on a challenge or two from Ellen’s special base in the Big Apple! Plus, P!NK is back for more! Emily Blunt, Ronda Rousey Sep 14, 2015 Emily Blunt, is here! The talented and beautiful star of the new film 'Sicario' returns to give Ellen a replay of her summer, talk movies, and get into a little fun and games! Then, she's been causing quite a stir with her bold moves, empowering attitude and impressive feats of strength. One of the best female MMA fighters in the world, RONDA ROUSEY makes her debut on Ellen, and it is guaranteed to make headlines! The star athlete will give Ellen insight into her new autobiography, My Fight/Your Fight, and of course, Ellen is not going to let all that strength go to waste. You won't want to miss it! On Monday, Ellen's got girl power! Justin Bieber, Silento, Josh & Austynn Samarco Sep 15, 2015 The boy who once sang to his Baby has grown into a charming man with his first #1 Billboard hit… JUSTIN BIEBER stops by to ring in Season 13! This month, the pop star became the youngest male artist to debut at #1, with his instant chart topper, What Do You Mean? He's here to give Ellen a little love, and to talk about the inspiration behind the song. He'll also surprise a fan with a very exciting opportunity! Then, two inspiring sisters get the surprise of their lives! This Tuesday, Ellen means business! Jesse Tyler Ferguson, Ed Oxenbould, Shirley Clements Sep 16, 2015 JESSE TYLER FERGUSON is here! He's been traveling all over the world for summer vacay, and now he's returning home to his Modern Family, and coming by to tell Ellen all about the brand new season! Then, he's the breakout star of M. Night Shyamalan's upcoming horror film The Visit, and he's also adorable and comes with an Australian accent… ED OXENBOULD is here! The 14-year-old actor from films like Alexander and the Terrible, Horrible, No Good, Very Bad Day and Paper Planes will make his debut on Ellen, and she's excited for the introduction! Some interesting people are paying a visit to Ellen this Wednesday! Dakota Johnson, Leona Lewis Sep 18, 2015 Earlier this year, she steamed up the big screen in the film adaptation of 'Fifty Shades of Grey,' now she's taking on an equally tantalizing project with the biographic tale of mobster Whitey Bulger… DAKOTA JOHNSON is here with a preview of her new movie, 'Black Mass'! Plus, singer LEONA LEWIS only gets 'Better in Time' and her 'Bleeding Love' continues to runneth over! The talented artist will take the stage to perform her new song 'Thunder' from her upcoming CD, 'I Am'! On Friday, Ellen is roaring with excitement! Ricky Gervais, Chris Cornell Sep 21, 2015 RICKY GERVAIS is back! After earning an Emmy nomination for the Neflix sitcom Derek, the British comedian with a knack for saying exactly what's on his mind (no matter what that may be!) is here for more fun, jokes and games with Ellen, because he can never get enough! Pitch, please… Ricky is just getting started! Then, bringing a Higher Truth to Ellen's stage, Soundgarden frontman and talented rocker CHRIS CORNELL performs Nearly Forgot My Broken Heart from his upcoming album! You'll never forget this Monday on Ellen! Viola Davis, Zachary Levi Sep 24, 2015 VIOLA DAVIS is here! The 'How to Get Away with Murder' star returns with details on the show's season premiere! You won't want to miss any clues she might drop. Then, 'Heroes Reborn' star ZACHARY LEVI comes through to mark the return of television's most popular squad of good people! The revival premieres this week, and he's sharing his superpowers with Ellen! This Thursday, Ellen's getting away with a lot! Wanda Sykes, David Arquette Sep 25, 2015 WANDA SYKES is back to make Ellen and her fans laugh till they cry! The standup comedian continues touring the country with her comical point of view, and every adventure gets replayed on our stage. If you can't live Wanda's life, you'll definitely want to hear about it! Then, DAVID ARQUETTE is here! The movie star is stepping onto the theatre stage for his role in the new play Sherlock Holmes, and he's got a look behind the curtain, and some updates on life! TGIF on Ellen! Claire Danes, Allison Holker, Andy Grammer Sep 28, 2015 As CIA agent Carrie Mathison on the hit TV series 'Homeland,' CLAIRE DANES is known for her dramatic edge, and her Golden Globe and Emmy-winning performances. The actress swings by Ellen to discuss all of the above, the latest season of her show and so much more! Then, ALLISON HOLKER and chart-topping singer ANDY GRAMMER will spin, swing, and swoop their way across the stage with a special routine, plus an inside look at 'Dancing with the Stars'! The stars are aligning this Monday on Ellen! Jason Segel, Don Henley Oct 1, 2015 JASON SEGEL returns, and he's got more nightmares to share with Ellen! The How I Met Your Mother star comes by with word on his latest book, Nightmares! The Sleepwalker Tonic, and perhaps Ellen will have something scary to share in return! Then, Grammy-winning music legend DON HENLEY will perform Take a Picture of This from his upcoming CD, Cass County, and a special request from Ellen! This Thursday, Ellen is getting to the heart of the matter! Lena Dunham Oct 2, 2015 LENA DUNHAM is always up to greatness with her ingenuity, zest, and superb comic ability… what could she possibly dream up next? A newsletter! She's here to tell Ellen all about it! The Girls actress, writer and producer returns with all the good news about her latest project, Lenny, along with updates on the fantastic world she lives in! The stories will be extraordinary this Friday on Ellen! Nathan Lane, Trai Byers, Rita Ora, Alek Skarlatos & Lindsay Arnold Oct 5, 2015 NATHAN LANE is here to tell stories about Naughty Mabel, his brand new children's book! The Broadway veteran and star of films like The Birdcage and The Producers returns to play catch-up with Ellen… and any other game she may devise! Then, it's one of the most scandalous, buzzed-about shows on television, and he's among the titans leading the Empire! Actor TRAI BYERS comes by! Plus, RITA ORA performs her chart-topping hit, Body on Me, which has reached over 32 million views on YouTube! And if that's not enough, French train hero and Oregon Army National Guardsman ALEK SKARLATOS will take the stage with his Dancing with the Stars partner LINDSAY ARNOLD to show off their moves! Ellen's feeling naughty and nice this Monday! Chelsea Clinton, Matt Bomer, The Band Perry Oct 8, 2015 CHELSEA CLINTON stops by! She's not only an accomplished journalist, new mom and American political royalty, she's also an author with a new book, 'It's Your World: Get Informed, Get Inspired and Get Going,' hitting shelves now! Ellen will hear all about Chelsea's adventures in motherhood, and how she feels about her own mother's historic run for President… hopefully, she'll also weigh in on Hillary's Whip/Nae Nae dance! Then, he's as hot as ever and he's taking a turn toward the dark side in 'American Horror Story: Hotel'… MATT BOMER is here, and everyone knows Ellen loves finding ways to put his handsomeness to use! Plus, country trio THE BAND PERRY performs their new song 'Live Forever' from their upcoming album! On Thursday, Ellen's informed, inspired, and going strong! Sen. Bernie Sanders, Shaping Sound Dance Company Oct 15, 2015 2016 Democratic presidential candidate Sen Bernie Sanders Also: a performance by Shaping Sound dance company. Ellen Page, Brett Eldredge Oct 16, 2015 Ellen Page (Freeheld (2015)); Miley Cyrus and Linda Perry; Nick Carter and Sharna Burgess; guest DJ Stephen Boss. Bradley Cooper, Melissa Benoist, Gary Clark Jr. Oct 19, 2015 Bradley Cooper (Burnt (2015)); Melissa Benoist (Supergirl (2015)) Also: Gary Clark Jr performs. James Corden, Florence and the Machine Oct 20, 2015 James Corden ("The Late Late Show with James Corden" (2015); Florence Welch. Also: Florence and the Machine perform. Sarah Silverman, Morris Chestnut, Of Monsters and Men Oct 21, 2015 Sarah Silverman (I Smile Back (2015)); Morris Chestnut (Rosewood (2015)). Also: Of Monsters and Men perform. Oprah Winfrey, 5 Seconds of Summer Oct 23, 2015 There’s almost nothing that OPRAH WINFREY cannot do, which makes her an amazing and inspiring guest to have on our show! 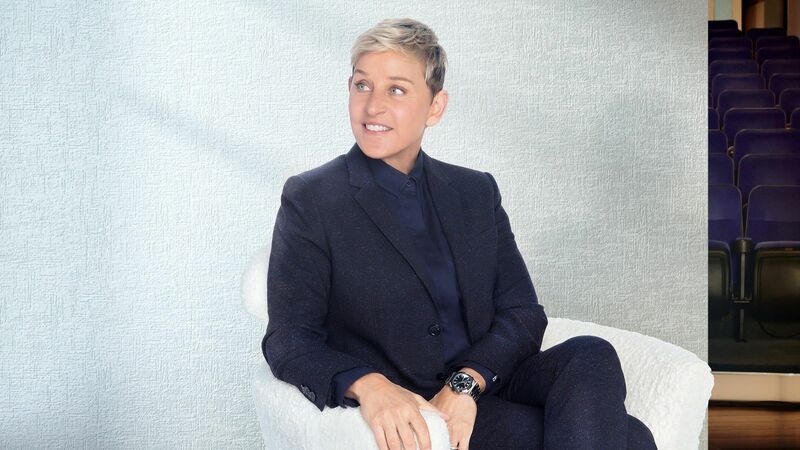 The media mogul and all-around wonderful woman returns to talk about the upcoming season premiere of “Oprah’s Master Class,” which features Ellen! If there’s anyone who should be guiding future leaders, it’s Oprah, and Ellen enjoys all the fun moments they have together!Plus, Ellen is spending as much time as possible with 5 SECONDS OF SUMMER! The superstar pop group will perform “She’s Kinda Hot” from their latest album, “Sounds Good Feels Good,” which hits the streets today!On Friday, Ellen sounds great, feels great, and looks great too! Heidi Klum, Trevor Noah Oct 28, 2015 Heidi Klum (Project Runway (2004)); Trevor Noah (The Daily Show (1996)) Also: a performance by Alessia Cara. Sandra Bullock, Billy Bob Thornton, Anthony Mackie Oct 29, 2015 Sandra Bullock, Billy Bob Thornton and Anthony Mackie (Our Brand Is Crisis (2015)). Josh Duhamel, Ariana Grande Oct 30, 2015 Ellen's Halloween show, featuring Josh Duhamel (Lost in the Sun (2015)), Ariana Grande (Scream Queens (2015)) and "Apparently Kid" Noah Ritter. David Spade, Giada De Laurentiis, Brett Eldredge Nov 2, 2015 David Spade; Giada De Laurentiis; and a 9-year-old Idaho boy who was born with half a heart Also: performances by 'iHeartMemphis' and Brett Eldredge. Rebel Wilson Nov 3, 2015 Rebel Wilson; presidential historian Macey Hensley. Michael Keaton, Little Mix Nov 4, 2015 Michael Keaton (Spotlight (2015)); Little Mix perform; guest DJ Stephen Boss. Will Smith, Greyson Chance Nov 5, 2015 The Ellen DeGeneres Show, often shortened to Ellen, is an American television talk show hosted by comedian/actress Ellen DeGeneres. Drew Barrymore, Sam Smith, Martha Stewart Nov 6, 2015 Drew Barrymore (Miss You Already (2015)); Sam Smith; Martha Stewart. Justin Bieber, Shonda Rhimes Nov 9, 2015 Justin Bieber is interviewed and performs; writer and producer Shonda Rhimes and a performance by 9-year-old hip-hop dancer Aidan Xiong. Rob Lowe, Justin Bieber, Kellie Pickler, Ed Sheeran, Jamie Lawson Nov 10, 2015 Rob Lowe (The Grinder (2015)); Justin Bieber; Kellie Pickler (I Love Kellie Pickler (2015)); Ed Sheeran Also: Jamie Lawson performs. Seth Rogen, Justin Bieber, Leon Bridges Nov 11, 2015 Seth Rogen (The Night Before (2015)); Justin Bieber; 11-year-old racecar driver MacKenzie Marsh Also: a performance by Leon Bridges. Kerry Washington, Justin Bieber Nov 12, 2015 Kerry Washington (Scandal (2012)); Justin Bieber; guest DJ Stephen Boss. Diane Keaton, Justin Bieber Nov 13, 2015 Diane Keaton (Love the Coopers (2015)); Justin Bieber performs in an outdoor concert . Khloe Kardashian, Justin Bieber Nov 16, 2015 Guess include author Khloé Kardashian (book, "Strong Looks Better Naked"); John Bughaw; guest DJ Stephen Boss Also: Ed Sheeran and Rudimental perform their duet, "Lay It All on Me". Eric Stonestreet, Harmony Zhu Nov 17, 2015 Eric Stonestreet (Modern Family (2009)); guest DJ Stephen Boss Also: 9-year-old piano prodigy Harmony Zhu performs. One Direction Nov 18, 2015 Interview and outdoor concert performance by One Direction ; martial artist Jesse-Jane McParland. Bryan Cranston Nov 19, 2015 Bryan Cranston (Trumbo (2015)); Sophia Grace Brownlee and Rosie McClelland Also: Ed Sheeran and Rudimental perform. Gwen Stefani, Steve Spangler Nov 20, 2015 Gwen Stefani (The Voice (2011)); science guy Steve Spangler; viral video star Lydia Lee; guest DJ Stephen Boss. Day 1 of 12 Days, Sylvester Stallone Nov 23, 2015 Sylvester Stallone (Creed (2015)); 3-year-old periodic-table expert Brielle Milla; "Ellen's 12 Days of Giveaways". Day 2 of 12 Days, Elizabeth Banks, Ellie Goulding Nov 24, 2015 "Ellen's 12 Days of Giveaways"; Elizabeth Banks (The Hunger Games: Mockingjay - Part 2 (2015)); young singer Kai Langer Also: a performance by Ellie Goulding. Day 3 of 12 Days, Jamie Foxx, Michael B. Jordan Nov 25, 2015 Ellen is stretching out the holiday season even further this year as DAY 3 of 12 DAYS OF GIVEAWAYS arrives the day before Thanksgiving! Ellen's fans will be extra thankful for the extravagant surprises she has in store. What will be revealed today? Something almost unimaginable!Then, if you're not "In Love By Now" with the charming and talented JAMIE FOXX, you might be after his next appearance on Ellen! The actor, musician and comedian returns to premiere his new music video and share in the holiday festivities! Jamie does great impressions and he's known for his serenades... whenever he comes around, everyone's in for a treat!Plus, MICHAEL B. JORDAN returns with a sneak peek at his new film, "Creed"! After taking Hollywood by storm with his Sundance hit, "Fruitvale Station," the actor teamed up again with filmmaker Ryan Coogler for this exciting new boxing movie, and he's got all the details!This Wednesday, 'tis the season to celebrate with Ellen! Day 4 of 12 Days, Kylie Jenner, Ed Sheeran & Rudimental Nov 30, 2015 It's DAY 4 of Ellen's 12 DAYS OF GIVEAWAYS, and the gifts are getting bigger, the cheers are getting louder, and Prancer is wilder than ever! What will Ellen stuff the stockings with today? Something out of this world as the extravaganza jingles on!Then, beautiful really does run in her genes, and she's coming by to share some of it with the rest of us... KYLIE JENNER is here to talk about her new product line, "Kylie Lip Kit"! The reality star will also give Ellen her take on all the fascinating things going on with her famous family, and will hopefully share some of their plans for the holidays!Spreading more good cheer along with her own take on the festivities, KYM DOUGLAS returns! There's no telling what she'll whip up from her bag of magic beauty fun, but it's guaranteed to be unique, useful and something you've probably never seen before!Plus, the British are coming... when ED SHEERAN takes the stage with RUDIMENTAL! They'll perform their duet, "Lay It All on Me," which is featured on Rudimental's album, "We the Generation"!On Monday, Ellen's decking the halls from top to bottom! Day 5 of 12 Days, Wanda Sykes, Kunal Nayyar, Sia Dec 1, 2015 Boxes wrapped and filled with gadgets, gifts so big you can't even fit them into a package, and getaway trips galore! These are just a few of the things Ellen has given away so far, and there's more to come today on DAY 5 of 12 DAYS OF GIVEAWAYS!Keeping spirits high, smiles wide and laughter coming, WANDA SYKES is here to share her holiday tales with Ellen! It's always a celebration when the comedian comes through, and with a new role on the hit series "Black-ish," Wanda has even more to talk about than usual!Then, KUNAL NAYYAR swings by! He's bolstering his comedy realm with a new book, "Yes, My Accent Is Real: And Some Other Things I Haven't Told You," and he'll spill some of those amusing anecdotes today!Plus, SIA returns to perform her hit song, "Alive"!You'll be telling everyone about this Tuesday on Ellen! Day 6 of 12 Days, Anna Faris, Darby Stanchfield Dec 2, 2015 Anna Faris (Mom (2013)); Darby Stanchfield (Scandal (2012)); guest DJ Stephen Boss Also: Tori Kelly performs; "Ellen's 12 Days of Giveaways" continue. Day 7 of 12 Days, Sofia Vergara Dec 3, 2015 Sofía Vergara ("Ninja Coffee Bar"); Rachel Platten performs; guest DJ Stephen Boss Also: "Ellen's 12 Days of Giveaways" continues. Usher, Coldplay Dec 4, 2015 The Ellen DeGeneres Show, often shortened to Ellen, is an American television talk show hosted by comedian/actress Ellen DeGeneres. Day 9 of 12 Days, Harrison Ford Dec 7, 2015 Harrison Ford (Star Wars: Episode VII - The Force Awakens (2015)); "Ellen's 12 Days of Giveaways" Also: a performance by The Acrobots hoverboard dancers. Day 10 of 12 Days, Samuel L. Jackson, Joshua Jackson, Chris Young Dec 8, 2015 Samuel L Jackson (The Hateful Eight (2015); Joshua Jackson (The Affair (2014); a bone-marrow transplant recipient and her donor; Chris Young performs; guest DJ Stephen Boss. Day 11 of 12 Days, Nick Cannon, 'Dancing with the Stars Live'! Dec 9, 2015 Nick Cannon (Chi-Raq (2015)); Dancing with the Stars (2005) professionals perform; guest DJ Stephen Boss Also: "Ellen's 12 Days of Giveaways". Day 12 of 12 Days, Kat Dennings Dec 10, 2015 Kat Dennings (2 Broke Girls (2011)); guest DJ Stephen Boss; "Ellen's 12 Days of Giveaways". Andy Samberg, America Ferrera Dec 11, 2015 Andy Samberg (Brooklyn Nine-Nine (2013)); America Ferrera (Superstore (2015)); "Ellen's 12 Days of Giveaways" bonus day; guest DJ Stephen Boss. Idina Menzel Dec 14, 2015 Idina Menzel; Carrie Fisher (Star Wars: Episode VII - The Force Awakens (2015)); 6-year-old Braylon Beam, who has brain cancer Also: bonus day of "Ellen's 12 Days of Giveaways". Lupita Nyong'o Dec 15, 2015 Lupita Nyong'o (Star Wars: Episode VII - The Force Awakens (2015)); Uzo Aduba (Orange Is the New Black (2013)); bonus day of "Ellen's 12 Days of Giveaways". Tina Fey Dec 16, 2015 Tina Fey (Sisters (2015)); bonus day of "Ellen's 12 Days of Giveaways". Daisy Ridley, Oscar Isaac, John Boyega, Dax Shepard Dec 17, 2015 Daisy Ridley, Oscar Isaac and John Boyega (Star Wars: Episode VII - The Force Awakens (2015)); Dax Shepard (Parenthood (2010)) Also: bonus day of "Ellen's 12 Days of Giveaways". Beth Behrs Dec 18, 2015 Beth Behrs (2 Broke Girls (2011)) Also: bonus day of "Ellen's 12 Days of Giveaways". Steve Carell, Justin Bieber Dec 21, 2015 Steve Carell (The Big Short (2015)); Mark Wahlberg (Daddy's Home (2015)) Also: bonus day of "Ellen's 12 Days of Giveaways". Jennifer Lopez Jan 5, 2016 Jennifer Lopez (Shades of Blue (2016)); guest DJ Stephen Boss. Ricky Gervais, Saoirse Ronan Jan 6, 2016 Ricky Gervais; Saoirse Ronan (Brooklyn (2015)); guest DJ Stephen Boss. Queen Latifah, Marlon Wayans Jan 7, 2016 Queen Latifah ("The Wiz Live" (2015)); Marlon Wayans (Fifty Shades of Black (2016)); guest DJ Stephen Boss Also: a performance by Shaping Sound dance company. Leonardo DiCaprio, Eva Longoria Jan 8, 2016 Leonardo DiCaprio (The Revenant (2015)); Eva Longoria (Telenovela (2015)); Bob Harper (The Biggest Loser (2004)); guest DJ Stephen Boss. Hillary Clinton Jan 11, 2016 Democratic presidential candidate Hillary Clinton; guest DJ Stephen Boss. Kevin Hart, Kygo featuring Parson James Jan 12, 2016 Kevin Hart (Ride Along 2 (2016)); a performance by Kygo, featuring Parson James. Allison Janney, Charlie Puth Jan 13, 2016 Allison Janney (Mom (2013)); guest DJ Stephen Boss Also: a performance by Charlie Puth. LL Cool J, Aubrey Plaza Jan 14, 2016 LL Cool J (NCIS: Los Angeles (2009)); Aubrey Plaza (Dirty Grandpa (2016)); an 8-year-old hip-hop dancer. John Krasinski, Ken Jeong, Bob Harper Jan 15, 2016 John Krasinski (13 Hours: The Secret Soldiers of Benghazi (2016)); Bob Harper (The Biggest Loser (2004)); Ken Jeong (Ride Along 2 (2016)). Elton John Jan 18, 2016 Elton John is interviewed and performs; 4-year-old periodic-table expert Brielle Milla. Sean Hayes, Dierks Bentley, Keke Palmer Jan 19, 2016 Sean Hayes (play, "An Act of God"); Keke Palmer (Grease Live! (2016)) Also: Dierks Bentley performs. Zac Efron, Lauren Cohan Jan 20, 2016 Zac Efron (Dirty Grandpa (2016)); Lauren Cohan (The Walking Dead (2010) and The Boy (2016)); a teen hero. Chelsea Handler, Gina Rodriguez Jan 21, 2016 Chelsea Handler (Chelsea Does (2016)); Gina Rodriguez (Jane the Virgin (2014)). Kourtney Kardashian, MUTEMATH Jan 25, 2016 Kourtney Kardashian (Kourtney Kardashian Official App); Charles "LaLa" Evans, a Mississippi man who turned his house into a monument to his late wife, who he was married to for 59 years Also: a performance by Mutemath. Mario Lopez, 'Bachelor' Ben Higgins Jan 26, 2016 Mario Lopez (Grease Live! (2016)); Ben Higgins (The Bachelor (2002)); 8-year-old fitness enthusiast Demarjay Smith, aka the "Jamaican Trainer" from the Bronx. Jack Black, Olivia Munn, Bob Moses Jan 27, 2016 Jack Black (Kung Fu Panda 3 (2016)); Olivia Munn (Zoolander 2 (2016) and Ride Along 2 (2016)); Powerball winners John and Lisa Robinson from Tennessee Also: Bob Moses performs. Channing Tatum, Troye Sivan Jan 28, 2016 Channing Tatum ("Hail, Caesar" (2016) and The Hateful Eight (2015)); a performance by Troye Sivan; guest DJ Stephen Boss. Hilary Duff, Dereck & Beverly Joubert Jan 29, 2016 Hilary Duff (Younger (2015)); Beth Stern (Kitten Bowl (2014)) Also: Cam performs. Hugh Jackman, Taron Egerton Feb 1, 2016 Hugh Jackman and Taron Egerton (Eddie the Eagle (2016)); filmmakers Dereck Joubert and Beverly Joubert. Judge Judy Sheindlin, Jacob Tremblay, Sia Feb 2, 2016 Judge Judy Sheindlin (Judge Judy (1996)); Jacob Tremblay (Room (2015)); Sia is interviewed and performs. Jason Sudeikis, Tim Tebow Feb 3, 2016 Jason Sudeikis (Race (2016)); NFL quarterback Tim Tebow discusses "Night to Shine". George Clooney, Rihanna Feb 4, 2016 George Clooney ("Hail, Caesar! "); Rihanna; guest DJ Stephen Boss; a 6-year-old presidential enthusiast. Heidi Klum Panic! at the Disco Feb 5, 2016 Heidi Klum; a 6-year-old with brain cancer; guest DJ Stephen Boss Also: "Panic at the Disco" perform. Julie Bowen, Elton John Feb 8, 2016 Julie Bowen (Modern Family (2009)) Also: Elton John performs; guest DJ Stephen Boss. Megan Fox, Cast of 'Fuller House' Feb 9, 2016 Megan Fox (New Girl (2011) and Zeroville (2016)); Candace Cameron Bure, Jodie Sweetin and Andrea Barber with a preview of Fuller House (2016) Also: a performance by Demi Lovato and Fall Out Boy.